Saturday: Early clouds, spot shower, then clearing. 50s early, then 30s and 40s late. Sunday: Mostly sunny. Highs around 40. After record smashing warmth and rain on Friday, the last piece of the storm is moving out Saturday. A few morning showers will mark a wind shift, and the end of the mild air. Once winds change from south to west, gusting 20-40 MPH during the day, temperatures will tumble from the 50s into the 30s and 40s. Skies will clear during the afternoon, aside from a few mountain snow showers, and we’ll stay mostly clear into tonight. We’ll enjoy a beautiful view of the aptly named full ‘cold’ moon as lows drop into the 20s and 30s by morning. Sunday will be sunny and seasonable with highs around 40. A clipper drops through New England early on Monday with some snow showers. This won’t be enough to seriously impact travel, but it will bring a dusting to one inch for many spots. 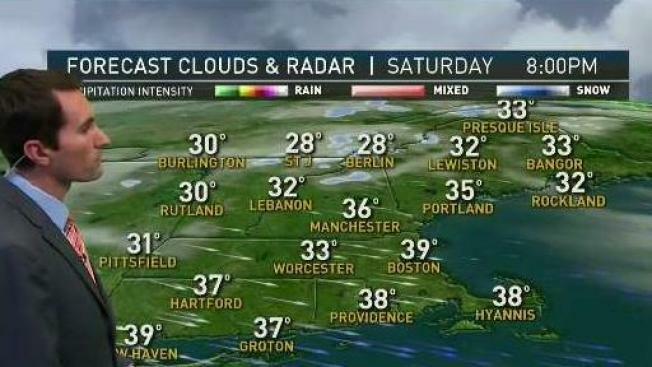 The south coast will be warm enough for rain showers, or more of a mix. Most of the precipitation ends by lunch, with drying during the afternoon. Highs will be in the 30s. Christmas Day, and the days that follow, looks chilly and bright with highs in the 30s. Our next storm after that arrives at the end of the week with rain and or a wintry mix.